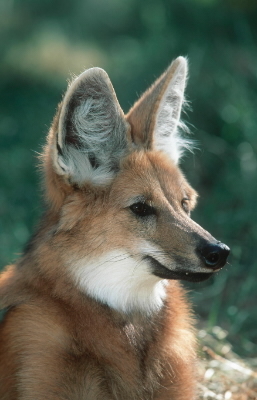 The maned wolf of South America is a magnificent animal with a pointed muzzle and very large erect ears. The maned wolf derives its name from the characteristic mane on its neck which stands erect when it scents danger. Its body is covered with long, reddish-brown hair. The mouth, the back and the tail of the animal is black. The tip of the tail, chin and throat are sometimes white. The long, almost black legs allow the maned wolf to see above the long grass while running. 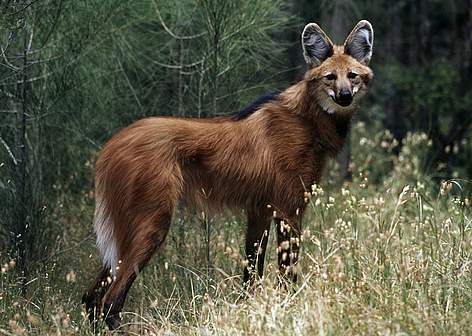 The maned wolf eats small mammals such as cuis (wild guinea pigs), rabbits and young viscachas (burrowing rodents) as well as pacas and agoutis, both fast-running rodents. Insects, reptiles and birds are a regular part of its diet but it also eats fruits, sugarcane and other plants. The most significant threat to the maned wolf is the drastic reduction of habitat, especially due to conversion to agricultural land. Many maned wolves are killed on roads and there is a further threat from domestic dogs, which chase maned wolves and may also pass on disease. The maned wolf has often been described as a 'fox on stilts' due to its red fur and long legs. Maned wolves do not hunt in packs like other wolves do.